We had hired a driver who took us to several locations for the day. His name was Prakesh and he gave us a cell phone to call him when we were finished at each site. It was up to us to find a tour guide if we wanted one at each location. It was an all day tour that lasted a total of 9 hours with much congestion as the local people prepared for the new year holiday, Diwali. Below you will find one sound map that encapsulates all four places visited. Once you click on the location, you will need to click on the play icon as well. Enjoy! Jama Masjid is a muslim temple that was built between 1644 – 1658 by Shah Jahan. It is located in the old city in the heart of Chandni Chowk. We had arrived there on a Friday and our guide told us that 5000 people were expected that day. We removed our shoes and placed them on the pile already formed just outside the entrance way. We were cloaked in brightly coloured over garments and then led inside the main courtyard which was filled with prayer rugs and as we walked around, our guide pointed out a small section in the back for the women devotees and explained that most women will pray at home. Beyond the northern walls of the temple lay the Muslim shopping area and to the south the windy streets of Chandni Chowk. In spite of these overly populated shopping areas, the courtyard seemed somewhat peaceful inside. There was an abundance of pigeons and children ran freely laughing and enjoying the open space. The red arched walls and inlay work seemed in perfect condition after hundreds of years of weathering. I separated from the guide and sat in the centre of the courtyard to capture the soundscape of Jama Masjid. The smell of curry wafted by as some people close to the fountain sat having a picnic a few meters away. Others people walked along the fountain edge or sat enjoying the open space. The heat of the sun warmed my face as I closed my eyes and turned on the recording device. Next we visited Raj Ghat, the final resting place of India’s leader, Mahatma Gandhi. 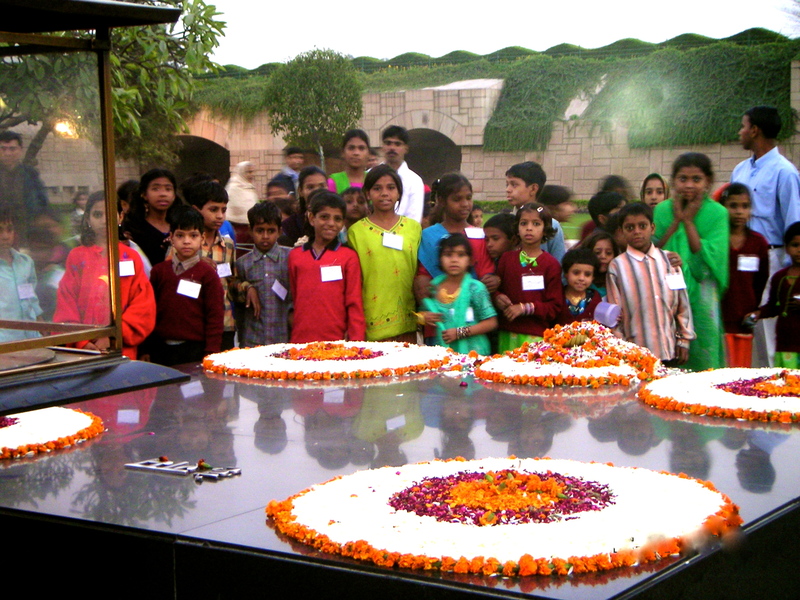 This location is the place where Gandhi was assassinated and cremated in 1948. By vast contrast, the area around Raj Ghat is a park. People are somewhat herded to stay on the cement pathway (understandably) and most respect this direction. We decided to walk the perimeter of the sight first which was along the edge of a wall. Once we arrived at the western entrance and walked down, we removed our shoes and stood before the dark marble slab that has the inscription “Hai Ram” meaning “Oh God” – Gandhi’s last words. Indian and international tourists alike surrounded the area and most people spoke in hushed tones while photographing their friends and loved ones in front of the eternal flame that is lit on one side of his burial place. There was a sense of stillness, sacredness, and a deep respect that resonated in this historical place. We eventually turned and walked away , collected our shoes and made our way back to the driver. 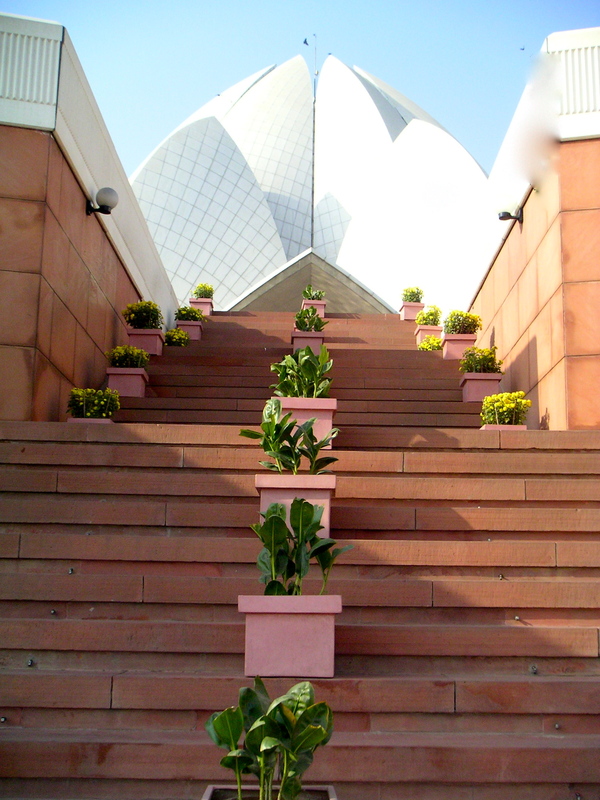 The Lotus Temple is located in the central part of New Delhi on 26 acres of land and cannot be missed from the street. It is giant 9-sided 27 white-marble petaled lotus flower that was designed by Fariburz Sahba in 1986 for the Baha’i faith. The Bahai philosophy embraces all religions and fundamentally believes in universal peace. No sermons or music can be played while chanting is allowed. When we arrived there were hundreds of people there and as we approached the temple, we were given a bag to put our shoes in. In turn we had to hand over this bag to an underground holding place. Uniformed school children gathered around to remove their shoes too, giggling and enjoying their field trip. We climbed the stairs and soon found our way to one of the 2 doorways they were allowing people in. A short explanation of the temple was given in both English and I assume Hindi, explaining that we were not allowed to wear shoes or speak once inside. The marble floor was cool against my feet and as we sat down the wooden framed bench was hard yet comfortable. We chose to sit fairly close to the front and center to enjoy the quietness of this sacred, beautiful structure and the 9 pointed star above that was shaped from the lotus petals allowed sunlight to stream down in rays that cast themselves around the room. Suddenly a man began to sing in a language I assume was Persian, Arabic or Farsi but I am not sure. To listen to these chants simple click on the map below. Qutb Minar is an extraordinary site that captures the foundational Hindu temple architecture that expresses itself through small Shiva statues to kama sutra positions to inlaid baskets and pillar shapes typical of Hindu architecture. In 1193 the Moghal sultan Qutb-ud-din built over and destroyed the Hindu gods by defacing them and knocking structures down. There are many Moghal sections to Qut’b Minar including 2 tombs – one for Iman Zamin and one for Altamish who died in 1235; a minaret which is 73metres high and a UNESCO World Heritage Site; an iron pillar; mosques; gardens; a school in ruins and even a summer palace. Most of the structures were built in red sandstone and have Qu’ran scriptures carved into the surfaces. the pavilion and tombs were all built with white marble and prayers are also carved into them. When we arrived at Qut’b Minar, we rented an audio guide which turned out to be a cartoon like guide that soon lost our interest. We decided to experience the ruins in an anti-clockwise fashion from right to left and wended our way through all of the monuments. It had been a long day and we were tired and perhaps rushed through the structure instead of taking our time. The sun was shining and the birds were chirping everywhere. Unlike Jama Masjid, the birds were not pigeons but instead small black birds with orange beaks. Many people were there with their families and as we made our way to the tomb of Iman Zamin we couldn’t help but to stop in the southern grand entrance way, Alai Darwaza, to admire the sandstone architecture in all it’s glory. There were a group of school girls all dressed in sarees and sarwal chamis that passed us and I decided to enter into the Iman Zamin tomb. Inside it was quiet; the prayer wall in the direction of Mecca with the tomb placed right in the centre of the chamber. The marble was ornately carved and allowed for light to illuminate the small structure. I began to record and suddenly found myself surrounded by Indian tourists. All in a day in the life of Iman Zamin’s tomb!